Wie wohnen eigentlich Architekten? Stimmt auch hier der Spruch, dass der Schuster die schlechtesten Schuhe hat oder ist es vielmehr so, dass sich am eigenen Haus jeder Architekt austoben kann? Dieser Beitrag soll einen kleine Einblick geben wie Paul Durand von Winter Street Architects (Salem, MA, USA) lebt. Ich hoffe, dass diese nicht der einzige Artikel dieser Art bleibt, sondern auch andere Architekten ihr Türen öffnen. Was die Architekten unter den Leser jetzt sehr gerne als Aufruf verstehen dürfen. Dieser erste Einblick wird in englisch veröffentlicht. Die Geschichte zum Hauskauf ist aber übersetzt und den deutschen Text kann man am Ende lesen. In der Zukunft wird es eine bessere Lösung geben englische Texte in deutsch und deutsche Texte in englisch zu lesen. Versprochen. _Paul Durand [pd]: 1959	by Boston, Massachusetts Architect David Abrahams. How would you describe the style of your home? _pd: Classic Midcentury Modern, California Styled Ranch. The house is a classic, midcentury, modern home built in 1959. It was the dream of a young couple, Ed and Ellaine Weisman who lived in Swampscott. They bought land in a new, secluded development in Wenham and hired Boston architect David Abrahams to design a California Styled Ranch for New England. The house is modest and elegant and grand at the same time. Not huge, but spacious and efficient. Not ordinary, even peculiar in ways, but beautiful nonetheless. The house is tucked into the side of a steep hill providing privacy as the ground rises up behind and provides vistas as it drops away steeply in front. This gave rise to an inverted layout where the main entry winds around to the back of the house and the traditional “backyard” is out front. Landscaping and sculptures give you a clue but it is common for first time comers and the pizza delivery guy to climb up steep embankments and wander around the glazed living area seeking the “front door” which is actually located in the rear. The main space revolves around a grand gesture of an angular stone and wormed chestnut fireplace that faces a large living/dining area with a ceiling that soars upwards and terminates far beyond a wall of glass. The glass faces south and extends perfectly to deny July sun but welcomes it back during frosty December. Opposite is the kitchen/breakfast area where shorter but abundant glazing provides views to a garden and beyond to the wooded hillside. 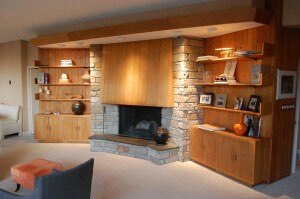 Do you have the house / apartment designed, remodeled or inhabit it as it was? _pd: Aside from minor repairs, we inhabit the house exactly as it was built. Would your house / apartment of your dreams look different? _pd: No, I bought this house because it closely resembled what I would design for myself. If major modifications were made I would make the dressing area and bathrooms more luxurious and extend the crawls space under the kitchen to a full basement to create more room downstairs. Otherwise, it captures the open, light, warm livability we needed in a home. The last thing Ellaine Weisman said to me as we closed the business deal that transferred her dream to us was, “I have had the great pleasure of living in this house for many years and it’s time for me to give that pleasure to someone else who will appreciate it as much as we have. It’s not the house so much as the love that was nurtured by it and I’m happy to now share that with you”. She was right. Our family changed after living in this place. We were close but became closer, we loved each other but are more loving than before and we enjoy each other greater than ever. Our house allows us to live each in our own way but in the midst of each other. We’re more in tune and we all love the way we live. It’s a great testament to the power of architecture. It shapes life. Repairs and alterations – do you do it yourself? What are you missing at home yet? _pd: A larger, luxurious master bathroom. I had just finished a complete renovation of a stately Victorian home on the Salem Common. That house had been the origin of our firm and namesake: Winter Street Architects, and after 19 years of living there I was settled. I was on vacation when an interior designer at the firm, who was shopping for homes, called and said, “You have to see this house I found, it’s you; you have to have it”. On my way home I drove by hoping not to like it, to avoid the hassle of selling the Victorian and moving to a new community, changing my five minute walking commute into a twenty minute drive. Upon pulling into the driveway I immediately knew she was right; It WAS me, and I had to have it. The house she found was modern, open, filled with light, and had plenty of views to a mature orchestrated landscape. There was the close connection to the outdoors and an open style of living that provided a social connection within the family, quite contrary to the 3-story compartmentalized plan of our Victorian. The house was perfect for me and the land and location met my wife’s desires for a less urban setting. The neighborhood, sculpted onto Lord’s Hill, was a perfect setting for my son who desired the independence of bike riding without mom or dad in tow and the offering of a plethora of new friends just down the street. The previous owner sported an impressive art collection, which made the house that much more attractive. She offered for sale a few pieces that she was reluctant to part with, but felt they belonged more to the house then to her. I treasure those pieces just as much and I treasure her husband’s landscape. Everyone who had previously worked at the house mentions his passion for the plantings and the lawn. It was his passing that put the house on the market and sent his wife to pursue art schooling in Mexico, giving my family the opportunity to buy the house of our dreams. I think he’s pleased though. His passion is now mine as I seek pastoral perfection in battling pests, lawn fungus and the plantings themselves that continually eat up available real estate and encroach upon one another. The last thing Ellaine Weisman said to me as we closed the business deal that transferred her dream to us was, “I have had the great pleasure of living in this house for many years and it’s time for me to give that pleasure to someone else who will appreciate it as much as we have. It’s not the house so much as the love that was nurtured by it and I’m happy to now share that with you”. She was right. Our family changed after living in her place. We were close but became closer, we loved each other but are more loving than before and we enjoy each other greater than ever. Our house allows us to live each in our own way but in the midst of each other. We’re more in tune and we all love the way we live. It’s a great testament to the power of architecture. It shapes life. Ich hatte gerade eine komplette Renovierung eines stattlichen viktorianischen Hauses in der Nähe des Salem Commons hinter mir. Das Haus war der Ursprung unseres Unternehmens und Namensgeber: Winter Street Architects, und nach 19 Jahren in diesem Haus war ich dort sesshaft. Ich war im Urlaub, als eine Innenarchitektin meiner Firma, die gerade auf Haussuche war, anrief und sagte: „Sie müssen dieses Haus sehen, das ich gefunden habe, es ist perfekt für Sie, Sie müssen es haben“. Auf meinem Weg nach Hause fuhr ich daran vorbei in der Hoffnung, es nicht zu mögen, um die Mühen des Verkaufs meines Hauses zu vermeiden und den Umzug in eine neue Gegend, die meinen fünf Minuten Fußweg zur Arbeit in zwanzig Minuten Autofahrt verwandeln würde. Als ich jedoch in die Einfahrt fuhr, wusste ich sofort, dass sie recht hatte, es war perfekt, und ich musste es haben. Das Haus war modern, offen, voller Licht, und hatte viele Ausblicke in eine reife und gut orchestrierte Landschaft. Es gab dort eine enge Verbindung zum Freien und eine offene Art zu leben, die eine soziale Bindung der Familie ermӧglichte, ganz im Gegensatz zu dem in drei Stockwerke aufgeteilten Plan des viktorianischen Hauses. Das Haus war perfekt für mich, und das Grundstück und der Standort erfüllten die Wünsche meiner Frau für ein weniger urbanes Umfeld. Die Nachbarschaft, die sich auf Lord’s Hill erstreckte, war eine perfekte Kulisse für meinen Sohn, der die Unabhängigkeit beim Fahrradfahren genoss, ohne Mama oder Papa im Schlepptau und das Angebot einer Vielzahl von neuen Freunden in nächster Nähe. Das Haus ist ein moderner Klassiker, gebaut im Jahre 1959. Es war der Traum eines jungen Paares, Ed und Ellaine Weisman, die in Swampscott lebten. Sie kauften Land in einer neuen, abgelegenen Gegend in Wenham und beauftragten den Bostoner Architekten David Abrahams, ein Ranch House im Kalifornienstil für New England zu entwerfen. Das Haus ist klein und elegant und gleichzeitig grossartig. Nicht riesig, aber geräumig und effizient. Nicht gewöhnlich, sogar etwas eigenartig, aber dennoch schön. Das Haus liegt versteckt an der Seite eines steilen Hügels, und bietet damit eine gute Privatsphäre, mit der Anhöhe hinter dem Haus und weiten Aussichten von der Vorderseite. Dies führte zu einer umgekehrten Anordnung, mit dem Haupteingang auf der Rückseite und dem Garten vor dem Haus. Die Landschaftsgestaltung und Skulpturen geben einen Anhaltspunkt, aber es ist üblich, dass Erstbesucher und Pizzadienste die steilen Böschungen hinaufklettern und um den verglasten Wohnbereich herumwandern in der Suche nach der Haustür, die sich tatsächlich auf der Rückseite befindet. Das Zentrum des Hauptraumes ist ein grandioser Natursteinkamin mit Wurmkastanienholz, an den sich ein grosser Wohn- und Essbereich anschliesst, mit einer Decke, die nach oben ragt und weit hinter der Glaswand endet. Das Glas zeigt nach Süden und erstreckt sich perfekt, um die Sonne im Juli zu vermeiden, aber im frostigen Dezember willkommen zu heissen. Gegenüber befinden sich die Küche und der Frühstücksraum, wo die kleinere aber reichliche Verglasung einen Blick auf den Garten und darüber hinaus auf die bewaldeten Hügel bietet. Der bisherige Inhaber besass eine beeindruckende Kunstsammlung, die das Haus noch attraktiver machte. Sie bot mir ein paar Stücke zum Verkauf an, an denen sie sehr hing, aber sie empfand, dass sie mehr zum Haus als zu ihr gehörten. Ich schätze diese Kunstwerke genauso, wie auch die Landschaftsgestaltung ihres Mannes. Jeder, der zuvor an dem Haus gearbeitet hatte, erwähnte seine Leidenschaft für die Pflanzen und den Rasen. Es war sein Ableben, das die Frau dazu bewog, das Haus zu verkaufen und ihre Kunstschulbildung in Mexiko fortzusetzen. Damit hatte meine Familie die Möglichkeit, das Haus unserer Träume zu kaufen. Ich glaube, er wäre froh. Seine Leidenschaft ist jetzt meine, ich suche pastorale Perfektion im Kampf gegen Schädlinge, Rasenpilze und die Pflanzen selbst, die ständig die letzte verfügbaren offenen Flächen und sich gegenseitig verschlingen. Das letzte, was Ellaine Weisman zu mir gesagt hat, als wir unser Geschäft besiegelten, mit dem sie uns ihren Traum übergab, war dies: „Ich habe die vielen Jahre in diesem Haus sehr genossen, und nun ist es an der Zeit, diesen Genuss andere erleben zu lassen, die ihn so schätzen, wie wir ihn geschätzt haben. Es ist weniger das Haus als die Liebe, die davon genährt wurde, und es macht mich froh, es mit Ihnen teilen zu können.” Sie hatte Recht. Unsere Familie hat sich geändert, nachdem wir in ihrem Haus gewohnt haben. Wir waren uns nahe, aber wurden uns näher, wir liebten einander, sind aber nun viel liebevoller, und wir sind gerne zusammen, mehr als je zuvor. Unser Haus ermöglicht es uns zu leben, jeder in unserer eigenen Art und Weise, und gleichzeitig in der Mitte der anderen. Wir sind mehr im Einklang, und wir alle lieben die Art, wie wir leben. Es ist ein großer Beweis für die Macht der Architektur. Sie formt das Leben. Paul Durand, Sr. Principal, Winter Street Architects, Inc.